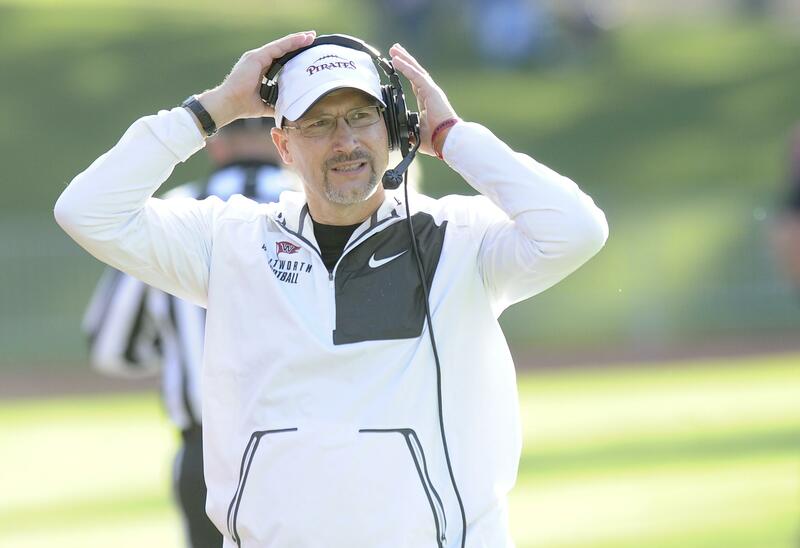 The atmosphere was thick with enthusiasm Monday morning among the Whitworth football players and even the coaches. It was even thicker than the air itself. After an opening day in the Pine Bowl, unhealthy air quality pushed the Pirates indoors for their second fall practice. They hardly missed a beat. “If you’re a coach at this time of year and you’re not excited, then you shouldn’t be coaching,” said fifth-year coach Rod Sandberg. Some of the players wouldn’t even concede that much to the smoky skies. That’s important, as the Pirates (8-2 overall last year and 5-2 in the Northwest Conference) are looking for a successor to record-breaking quarterback Ian Kolste. The top candidates are junior Leif Ericksen and sophomore Connor Johnson. No matter who’s under center, the passing game will get a boost from Division III All-America candidate Tyler Adamson, a left tackle who beefed up his resume and his physique with offseason training in Hawaii. “It was life-changing,” said the 6-foot-5, 292-pound Adamson, who hopes to play professionally. One thing that won’t change is the offense. Sandberg and offensive coordinator Alan Stanfield are committed to the spread. “You play to your strengths,” said Sandberg, whose roster includes 16 wide receivers but just one tight end. On the other hand, Sandberg is quick point out that Whitworth’s rushing offense ranked second last year in the Northwest Conference even as the passing game topped the charts. Defensively, the Pirates return a veteran line that should be even better than the unit that allowed 167 rushing yards per game last year. “Our front four has a chance to be dominant and deep,” said Sandberg, who is looking for players to step up at inside linebacker and in the secondary. “We’re excited to see these guys out there, and we think they’re capable,” Sandberg said. Whitworth will hold morning practices the rest of this week. The Pirates open the season at home on Sept. 1 against LaVerne. Published: Aug. 13, 2018, 8:45 p.m.